Some New Domains improve your online presence by making it more specific, while others expand on your choices for a generic domain. .LINK is the latter: It's a term that everyone will recognize, and there's awesome availability. Best of all, .LINK registrations are on sale for $6.99 through Oct. 31, 2015. Our Bottoms Rupp Happy Hour is every Thursday from 3–5 p.m. MDT. Today's sale is $0.99 .BIO registrations, and later this month we're having a $0.99 sale on .NEWS, .VIDEO, and .SOCIAL. Bookmark the Happy Hour page to stay up to date on the latest sale. A first name-last name domain is great for creating an online portfolio or forwarding to a professional network like LinkedIn. 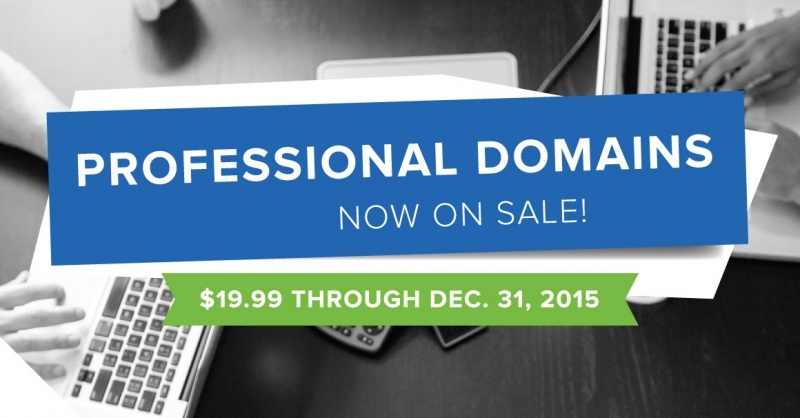 You can take it a step further by using a domain that specifies your profession, and .ATTORNEY, .VET, .ENGINEER, .DENTIST, .CONSULTING, .LAWYER, and .IMMOBILIEN are all just $19.99 through Dec. 31, 2015. The leaves are changing, the air is getting crisp, and Halloween is around the corner. So in honor of the arrival of Fall, your October 2015 promo code is CARAMELAPPLE. Use it at checkout for $10.25 .COM/.NET registrations and renewals.